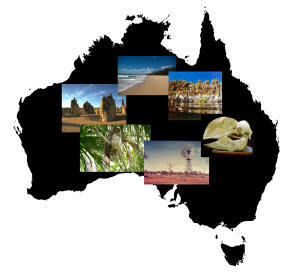 The history of Australia starts at the beginning of the history of the Earth. The earliest known blocks of crust on Earth are the seeds around which the Australian continent grew. The Earth is believed to have formed about 4550 million years ago, and only a short time later the dated rocks of the beginnings of Australia solidified. The recently released ABC documentary Australia: The time traveller's guide: A natural history of the Australian Continent, though having no connection with my site, and being released a number of years after I uploaded the page Take a Journey Back Through Time to this site, illustrates many of the significant stages in the formation of Australia and the evolution of life covered on the relevant page on my site, starting the journey at the oldest rocks in Australia, that are the oldest dated rocks in the world, and continuing to the present. The Aboriginal Australia section of this site is now avalable as an ebook and a print-on-demand soft cover book, A biography of the Australian Continent Aboriginal Australia: a Students Guide. The information will continue to be available on this site free of charge and any additions will be continue to be added. The book Dark Emu by Bruce Pascoe has a lot of instances of Aboriginal agriculture gathered from the journals of early explorers and others in the early days of European settlement in Australia. A new study of what lies beneath East Antarctica that has not been published has important unexpected implications for the stability of the East Antarctic Ice sheet. Wherever ages are given in years before present, BP, the present referred to is conventionally set to 1950.